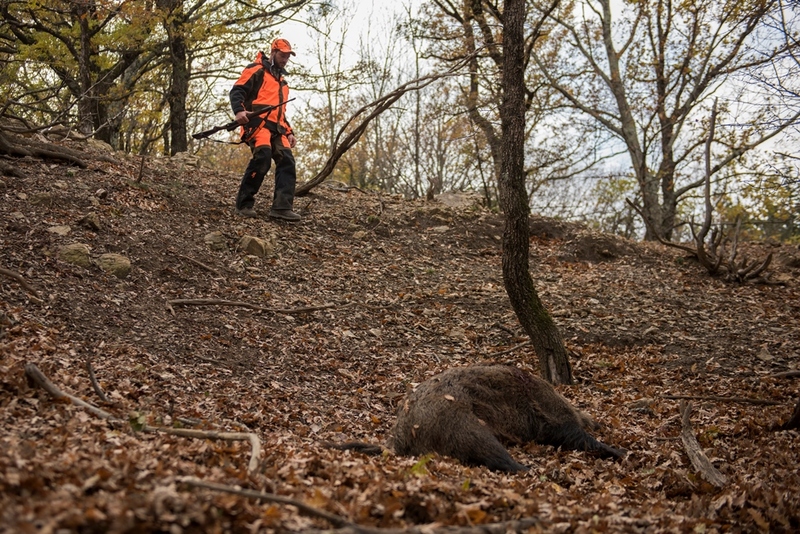 In late last November was Wild Boar season in Italy and it was time for me to fly to Tuscany, a region in central Italy with an area of about 23.000 square kilometers of beauty. Tuscany is known for its landscapes, traditions, history and artistic legacy. Having a strong linguistic and cultural identity, it is sometimes considered as “a nation within a nation”. Tuscany is a traditionally popular destination in Italy, and one of the main hunting destinations by wild Boar lovers. The landscape is full of agricultural plantations, vineyards are producing some of the famous Italian wines like Chianti, Vino Nobile di Montepulciano, Morellino di Scansano and Brunello di Moltalcino and let’s not forget the deep green strong bodies Extra virgin olive oil. The region thanks to the Oak trees also produces Oak nuts, Porcini, white and black Truffle. Combined to the mild climate for me this is the reason why Wild boar prosper in number in this region. Let’s talk about the wild boar (Sus Scrofa) also known as the wild swine or wild pig. A Bulky, massively built suid with short and relatively thin legs. The trunk is short and massive, while the hindquarters are comparatively underdeveloped. The region behind the shoulder blades rises into a hump and the neck is short and thick, to the point of being nearly immobile. The animal’s head is very large, taking up to one third of the body’s entire length. Eyes are small and deep-set, and the ears long and broad. The structure of the head is well suited for digging. The head acts as a plow, while the powerful neck muscles allow the animal to upturn considerable amounts of soil. They can upturn rocks weighing up to 40- 50kg. They have well developed canine teeth, which protrude from the mouths of adult males. Human intervention has spread its range further, making the species one of the widest-ranging mammals in the world, as well as the most widely spread suiform. Believe it or not but there are in around 16 subspecies recognized. Contact calls; grunting noise which differ in intensity according to the situation. Alarm Calls: Warning cries emitted in response. Combat calls: high pitched, piercing cries. Its sense of smell is very well developed, to the point that the animal is used for drug detection in Germany. It’s hearing is also acute that is why it’s very important to be very silent during the hunt if you stand at a stall. Though its eyesight is comparatively weak, lacking colour and vision and being unable to recognize a standing human 10–15 meters away. Pigs are one of four known mammalian species, which possess mutations in the nicotinic acetylcholine receptor that protect against snake venom. Wild Boar hunting has become a very popular hunt in Europe. After this long introduction of some characteristics of Wild Boar lets go back to my hunt. This time I had selected the following Browning clothing, Parka, x-treme traker pro, orange and green jacket and its relative pants. 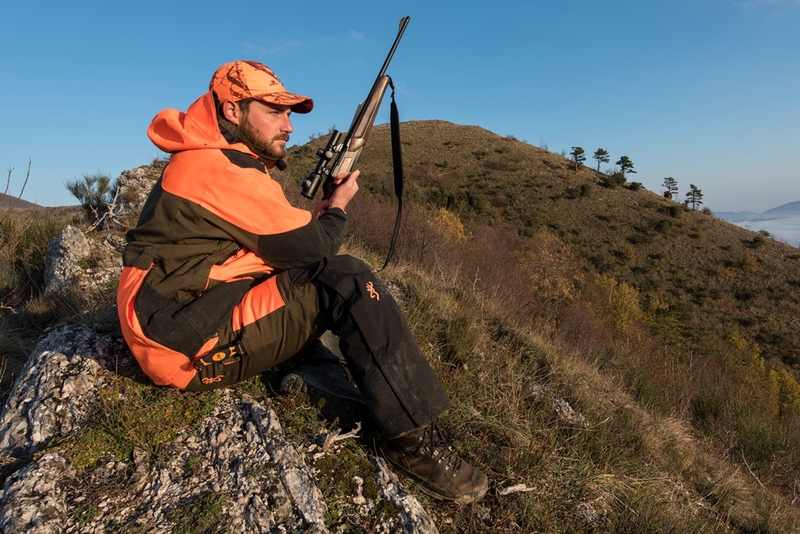 This type of clothing not only it has a high visibility but also is composed of strong but comfortable materials that allow demanding hunters to push throw the must hostile territories. I have been personally using this clothing not only for wild bore hunting but also for ruff shooting with springers. The Maral in 30-06 was with me and I used the Winchester Power Max Bonded in 180 gr rounds. 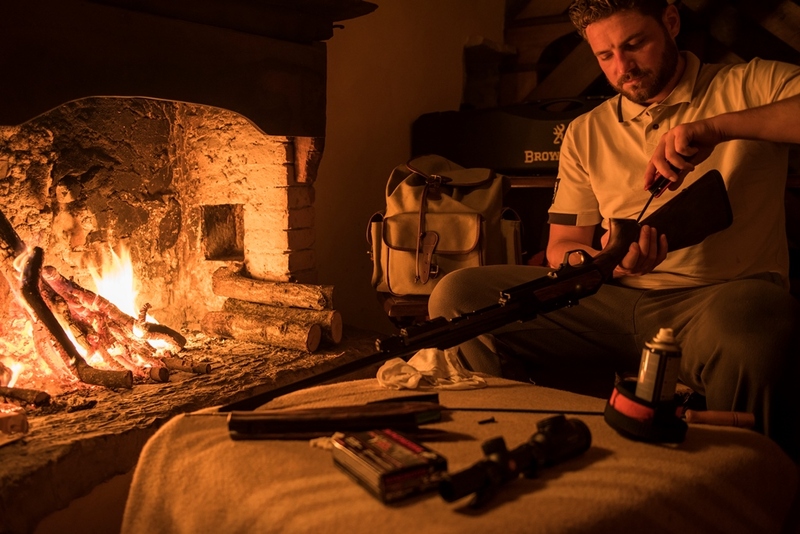 Once I had arrived to my hunting location friends had organized for me to stay in a beautiful cottage in Cortevecchia. I unloaded the car, organized my hunting clothing for the next day started the fire… Do you all know why? What is the first thing that you eat when you are in Toscany? “Fiorentina” a T-bone streak from a local animal with amazing flavour and texture characteristics. I was suggested to drive to a local butcher and I got myself some minced fillet to prepare myself a Tartare as a starter and also a 1.5kg on the bone Fiorentina. No vegetable. Just protein and local bread. On the way back to the cottage I saw a sign with a vineyard name so I proceeded down this very narrow road for about 3 km until I arrived to this open gate but it looked as if I was in the wrong place. As I was turning the car this man came out of the house and asked me if I was lost. When I replied that I was looking for the vineyard that was signee posted on the road he smiled and seed: “yes you are in the right place.” Then the question: “ What are you eating?”, I replied: “tartar and Fiorentina.” So he asked me to follow him and after a short walk we were in this small building with many different wine boxes. He suggested a particular bottle of red wine and I have to say that when I opened it while eating my meat it was perfect. When I will be back I will definitely get more. The next morning I was up and ready to go at 5 am since I had to drive to the meeting point because we were scouting the area for fresh foot prints and different tracks. At 7 am we met with the rest of the hunting party. As usual they picked every hunter name and allocated them with a different stall. I was given number 24. Once I got to my location I saw that it was a young vertically sloped, thick plantation with small water ponds and big rocks here and there. I decided to stay in high ground so I could over look the opening. I got my range finder so to have confirmation of different distances so to be ready if the boars would come out at different points. The furthest away was 125 meters and the closest was 50 meters. My bag was open and beside me the Maral of the shoulder and placed resting against a tree but it was not armed and it was still in safety. I was just listening on the radio the “CANAI” communicating. The Italian name for the hunters guiding the dogs in the search of the boars. For the first few hours it was like that. In complete silence listening to the radio. At around lunchtime the Canai came upon a big flock of boars. Estimated about 30-40 animals. The hunt was on. Every thing went crazy. Communications on the radio had increased by 1000%. A couple of shots from here and there in the far distance. After a short while I started smelling the typical smell of wild boar. It was strong. I could not understand why. The Canai were far away from me. Why am I smelling this? Then I realized it could have been another flock that was just passing through here. I got the Maral and as quietly as possible I loaded it up and I revoked the safety. My eyes where searching, my ears were listening, I was breathing deeply in search of the sent. Then, I heard a small rock moving from behind me, I turned very slowly, and I saw a big female just standing about 40 meters above me with her nose up in the air. She knew something was up but could not see me nor smell me. At the same time below me about 15 to 20 more animals were showing. They were looking at her waiting for the signal. Proceed or retrieve. I had to make a decision. Take the Alpha down so the rest of the flock would divide or wait… I went for the first option. With a quick and sharp movement followed by a shoulder shot the big Female was down. I quickly turned and thanks to the Maral being a straight pull I reloaded in a record time and I was ready for the second shot. The flock was moving forward all very close to each other so it was hard to have a clean shot at one of them. I did not have time all the flock had almost passed and I had to make a decision so, I let it go. Another boar was down and he was rolling down the steep slope. I reloaded again. I was exhausted. In those few brief moments I had given 100%. On the radio all the hunting party was asking who had shot? I replied after a few long breaths: “ I did, two down” a short silence and then: “ What? ?” so I explained everything that happened. What a lucky day I had. Soon after, help had arrived to give me a hand to drag the animals back to the road so they could be loaded on the pick ups .We returned to the hunting house and I found out that on that day 23 animals have been culled. I congratulated myself with the other successful hunters and we all sat down in few different tables to have some local Cheese, with different types of salami and wine. So what did I learn form this hunt? First of all that silence is a key factor. Placing my self against the wind and in a position where I can have a good idea of what is going on without having to move. The Maral made this possible this was possible. Thanks Straight Pull. Great story. Thanks for sharing your experience.